Ritchie, as described by his Uncle Cal. Appearance: Thin, like his uncle, but not nearly as tall. Ritchie has dirty blond hair, verging on light brown, and blue eyes like his father. Because of this, he sticks out like a sore thumb around all the brown-eyed Womacks. As a child, he’s wide-eyed with a smattering of freckles on his nose, and his hair is always messy and verging on long. He isn’t a fan of haircuts. As an adult, he wears a beard and sometimes a ponytail under a low-brim cap. Clean shaven, he has a boyish face well into adulthood. Secrets: Ritchie figures out he might have been an accident, and that his mother never intended to have a second child. Quirks: Ritchie is an observer, and often sifts into silent observation. This is a trait he has even before losing his hearing at age 7. He prefers watching conversations unfold, but does open up around those closest to him. Temperament & Personality: Ritchie is kind and thoughtful. He thinks more about others than he often does himself, which leads him to put others before himself time and time again. He makes bad decisions in an attempt to do the right thing for others. Religion: Methodist by birth, but not really religious in later years. It’s not that he doesn’t believe in God, it’s just that he doesn’t feel like he has a place in church at Pine Creek. If he does attend, he slips in after church has started and out again during the benediction, sitting in the back and not speaking to anyone. Likes: Ritchie loves horses, and has always felt at home among the animals on the farm. There’s nothing he likes better than an afternoon down by the creek. He likes Coca Colas, Janie Wall, his horse Blue, (and later her daughter Pear‚) reading (McCullers, is a favorite,) and being with his family. Life makes sense to him when he’s walking in the woods behind his house. 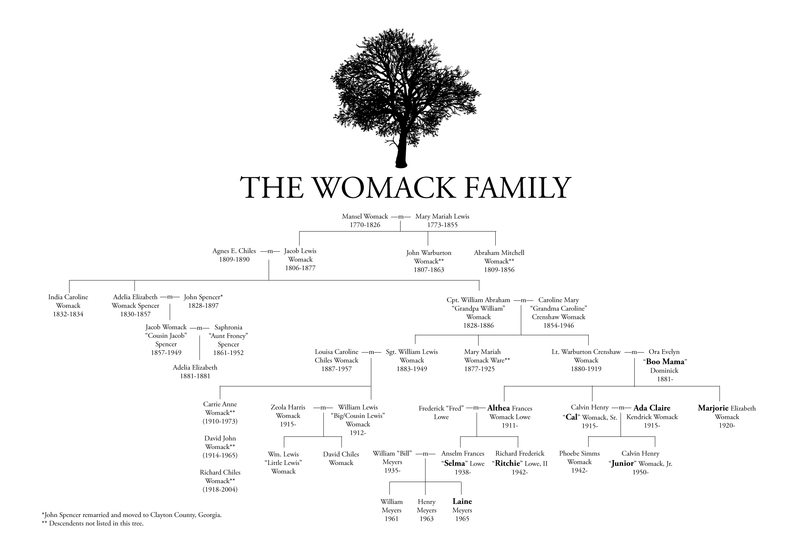 Close Relatives: Cal & Ada Claire Womack, aunt & uncle; Junior Womack, cousin; Boo Mama, grandmother.